Rod began coaching track and field at Kings in 1992 as an assistant coach for the jumping events. His role has steadily increased over the years, and he became the Head Track & Field Coach in 2018. Rod has coached over 100 state qualifiers in the jumps and javelin, 5 State Champions, and 20 school record holders in the long jump, high jump, triple jump, pole vault and javelin over the last 26 years. During his tenure, King’s track team has won 16 State Team Titles and placed in the top 4 a total of 38 times. He joined the cross-country staff in 1993, serving as an assistant for three years before stepping up to Head Coaching duties in 1996. During his XC tenure, the Knights have won 5 League Titles, 8 District Titles and qualified for the State Championships in 18 of 22 years. The Knights have won 4 State Championships and produced 4 individual State Champions. Meanwhile, the Lady Knights have won 3 League Titles, 8 District Titles and have also qualified for the State Championships 18 of the last 22 years. The Lady Knights have won 7 State Championships and produced 3 individual State Champions. Rod is only 1 of the 4 cross-country coaches in the State to take 35+ teams to the State meet and was named the Washington State Cross Country Coaches Association Boys Coach of the Year in 2000 and 2014, and Girls Coach of the Year in 2003 and 2008. In his youth at Pendleton High School, Rod high jumped 6 feet 6 inches and finished 10th at the State Championships. Rod also ran as part of a 4x100 relay that placed 4th at State and still holds the School and District Record (42.7sec.). He graduated from West Valley (Yakima), moved on to Yakima Valley C.C. and then to the University of Washington, where he jumped 6'10" for the Huskies, earning two Varsity Letters and, more importantly, earning his bachelor's degree in Psychology. Rod went on to earn his M.Ed. in Sport Psychology from the University of Western Australia. 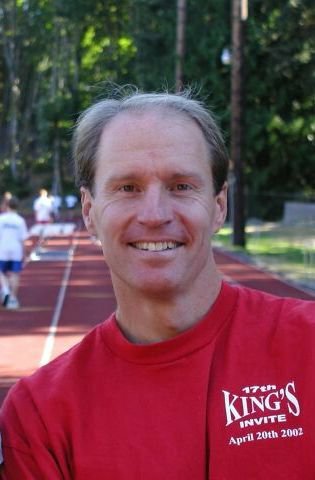 Since 1991, he has worked as a personal trainer at Harbor Square Athletic Club in Edmonds, while continuing his own athletic career at the National Masters Track & Field Championships and the World Masters Games. In 1999 he won his first National Championship (decathlon, 30-34 age group) and has since won 10 more National Titles. His ultimate goal is to break the decathlon world record in the 90-and-older age group.